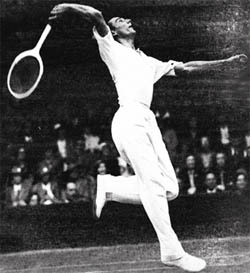 Fred Perry, one of many champions who joined a new pro players association. Buoyed by the success of the World Hardcourt Professional Championships (Click Here), Bill Tilden was convinced there was a market for a series of professional tournaments. Enlisting players such as Bobby, Don Budge, Fred Perry, and others, he formed a new organization, the Professional Players Association. Tilden, a veteran of early professional head to head tours, understood that the head to head format was flawed. Without the threat of elimination, the competitive element was missing and the matches were always susceptible to accusation they were either fixed or the players lacked incentive. Tilden's idea was to create professional tournament play. Over the years, calls had gone up to open all tournaments to both amateur and professional players, but the ruling amateur establishment staunchly opposed all such proposals, arguing that to do so would sully the "purity" of competition. Purity, however, had little to do with it. The system of under-the-table payoffs that amateur officials defended was de facto professionalism. What really was at stake was power and control over the game, which amateur officials clung to through their stranglehold on the major tennis events--the national championships and the Davis Cup—and by manipulation of the divisions between the players, the fans, the media, and each other.